From Australian terriers to border terriers, there are more than a dozen terrier mixes and more than a dozen ways to groom them properly. Basic grooming guidelines are derived from the length and texture of the dog's fur. 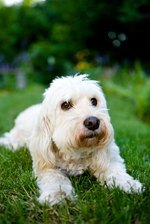 Certain terriers have long, thin hair that requires shears to cut through while others have short, thick hair that gets removed through the grooming process of "plucking." 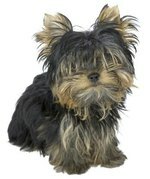 Brush your long-haired terrier once a day with a tight-wire bristle brush. Brush gently to remove knots or tangles. You may need to cut out a particularly thick knot with shears. Trim the excess hair once every three weeks. Grab a section of hair between your middle and pointer fingers. Clip away an inch at a time with shears. Repeat across the longer sections of hair. Hand strip the fur after combing and cutting. Dead and loosened hairs are "plucked" out, helping to ensure that the coat is even. If you see any long hairs you've missed, cut them out with the shears and hand strip the area again. Hand stripping doesn't hurt the dog. Bathe your dog once every three to four weeks. Long-haired terriers can have sensitive skin and hair, making frequent baths unnecessary, unless your dog gets unusually dirty during an outing. Pour lukewarm water over the dog. Lather a mild dog shampoo into its fur. Rinse the shampoo out completely using a cup to pour water through the hair. Brush your terrier's teeth once a week. Hold the lips of the mouth open, and brush gently with a soft-bristle toothbrush. Begin this practice as early into your dog's life as possible so your dog becomes accustomed to it. Play with your dog's paws when it's young to get it used to the feeling because terriers are notorious for hating nail clipping. Regularly clip its nails when a white or grayish length of nail begins to show past the regular length. 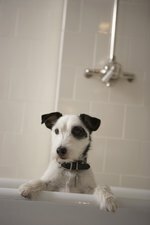 Failing to clip a terrier's nails could result in discomfort and limping. Comb short-haired terriers at most once a week with a fine-toothed comb. Base your combing schedule off of the the look of your particular dog's hair. Notice when it becomes knotted, matted or bunched up in places, and set your combing schedule a few days before this typically happens. Short-haired terriers look best when their hair is combed less often, which prevents a "puffy" look. Hand strip the coat after combing through it. The comb removes and loosens dead hairs, which then can be "plucked" with the hands in short, gentle grabs. This maintains the plushy feel of the overcoat. Brush your dogs teeth with a soft-bristle toothbrush once a week. Hold the lips of the mouth open, and brush gently with a soft-bristle toothbrush. Begin this practice as early into your dog's life as possible so your dog becomes accustomed to it. Bathe the terrier after combing and hand stripping the overcoat. Combing and hand stripping are much less effective once the hair is wet. Bathe your terrier once every three weeks, but comb its hair once a week. During the bath, lather the soap into the undercoat and through the overcoat. Use a damp towel to gently wipe the face, ears, legs and paws. Rinse the shampoo out completely using a cup to pour water through the hair.